The Progressive Left is allowed to Assault Members of its own Party based Entirely on RACE. These are the events that led to the kind of violence we have just experienced in Charlottesville. Whether you agree or not, there is an element in this nation that is BULLYING our nation into Real Fascism. Peaceful Assembly is the Right of ALL Americans, Airing Grievances a Constitutional Right. It is a shame that that some groups on both sides are just UNCIVIL and looking for a fight for the cameras. Evans, a Smyrna state legislator who is white, expected a tough audience at the Netroots Nation event, where her rival Stacey Abrams was treated like royalty. But she said she at least expected to be able to make it through her remarks. Almost as soon as she took the stage, a ring of demonstrators – some holding stark signs criticizing her – fanned out in front of Evans. The chanting soon followed. Pleading repeatedly for the room to speaks – “let’s talk through it,” she implored – the demonstrators at times drowned her out. It underscored the intense vitriol already rocking the race for governor. Abrams, seeking to be the nation’s first black female governor, has embraced a staunchly progressive platform and has pledged to mobilize a legion of minority voters who rarely cast ballots. Evans wants to rebuild a tattered coalition of liberals, working-class voters and suburbanites who have steadily spurned the party for the GOP. The two have divided the state’s party, each divvying up endorsements from high-profile politicians and support from key advocacy groups that doesn’t cleave to racial lines. Evans enjoys backing from prominent black politicians, while Abrams has a core of white progressive support. “Oh, y’all, let’s just talk for a second. Georgia is my home,” she said. She eventually tried to plow through her speech, emphasizing left-leaning values that Democrats share. “As we built resistance to President Trump – not me, to Trump – we must unite over these ideals,” she said. Abrams said in a statement that she would not “condemn peaceful protest” and that the demonstrators were voicing their concern with Evans’ support for a Republican-led effort to give the state new powers over struggling schools. That didn’t go far enough for fellow Democrats who called on her to rebuke the demonstration. 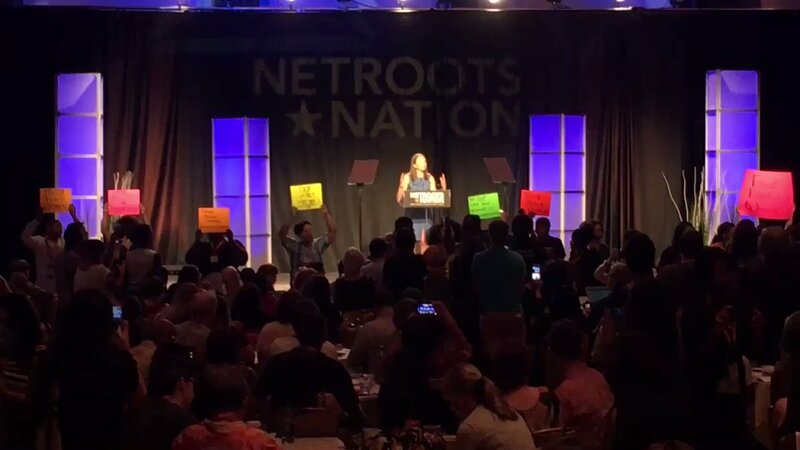 Evans joins the ranks of other Democrats who have been booed or heckled at Netroots events: Nancy Pelosi was booed and heckled in 2013, Black Lives Matter protesters interrupted Democratic presidential candidate Martin O’Malley’s speech in 2015. “I bet if they did, they’d be really upset to know that Abrams teamed up with Republicans to cut HOPE scholarships,” she said, referring to a 2011 deal Abrams struck with Gov. Nathan Deal aimed at preventing the lottery-funded program from going broke that slashed awards.